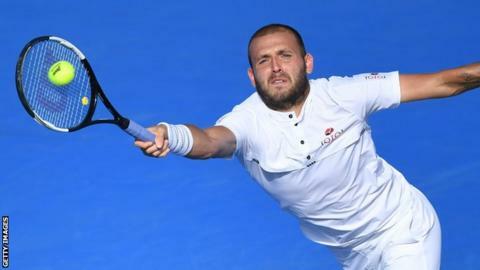 Britain's Dan Evans produced a double fault on championship point - after failing to convert three of his own - to miss out on his first ATP title. Evans, 28, lost 3-6 6-3 7-6 (9-7) in a dramatic Delray Beach Open final against Moldova's Radu Albot. Despite the agonising defeat, Evans is now back on the verge of the world's top 100 after a great week in Florida. Evans was unranked when he came back last April from a one-year ban for testing positive for cocaine. He won six matches after coming through qualifying, beating world number nine John Isner in the last four. But the final proved a match too far, despite providing moments of brilliance before eventually going down to 82nd-ranked Albot in the cruellest of manners. "It's easy to say I didn't take the match points but I thought he played great in the moments he needed to play great," Evans said. "I gave it a good go and it wasn't good enough. "It's a little unlucky to lose 7-6 in the third with big chances, obviously three match points, but I don't think I did much wrong. I missed two forehands, but not by a lot." Once the bitterness of the way he lost the match disappears, Evans will reflect on a positive week which saw him play some wonderful tennis, claim some notable scalps and reach the second ATP final of his career. And, with no ranking points to defend over the next couple of months, the former world number 41 will see this as a golden opportunity to seize the momentum and climb even higher up the rankings. British Davis Cup player Evans had been a break down in the first set against Albot before fighting back to win five of the next six games to claim the opener. But the Moldovan broke first in the second set, taking his second opportunity in the fourth game with a cross-court forehand for a 3-1 lead. Evans had played two more matches than Albot this week as he had to come through qualifying, with those extra exertions appearing to take their toll. Albot had come back from a set down to win his quarter-final and semi-final matches - against American fourth seed Steve Johnson and Mackenzie McDonald - and backed up the break with a hold to love on his way to levelling the match. The momentum stayed with him at the start of the final set, moving a break up for a 3-1 lead before an hour-long rain delay halted his progress. Albot initially returned the stronger as he threatened to go a double break up for a 5-2 lead, only for Evans to save a break point on his way to a vital hold and then break back in the next game to level up the set. Evans maintained the scoreboard advantage, and saw half chances at 15-30 at 5-4 and 6-5 disappear, before taking command of the tie-break. However, he was unable to get over the line as Albot recovered to become the first Moldovan player to win an ATP title.